Min focus: 3.5 ft. Considered the classic portrait lens, with ideal picture coverage of 23 degrees. Relatively large maximum aperture is convenient for pinpoint focusing and shooting in available light. Focuses down to 42. Accepts 52mm filters. Built-in lens hood. Sharpest lens made for 135 format; incredible resolving power. Heavier than a normal lens, but balances well on body. Terrific coatings and color rendition, closer focusing than average. Newer f/1.8 update supposedly as good or better, but info is subjective to reviewer. 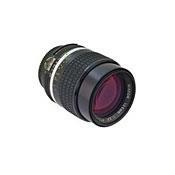 Readily available in great condition at reasonable cost, really useful even as a prime lens. Slowish at f/2.5 maximum, but not dim. Performance, optically and mechanically. Price (2014). Can be easily adapted for use on other brand DSLR's. I was shooting with a Nikon F3 when I bought my lens and it produced flawless images on film. Now I shoot with full frame Nikon DSLR's, and the lens performance is even better. My only complaint is I wish my DSLR had a split image focusing screen. It's a little soft in the corners at f2.5-4 which is perfect for portraits and once the lens is stopped down to f5.6-8 it is crisp corner to corner. My lens is very flair resistant. There are several versions of the 105/2.5 out there, the latest AIS version is the best, having improved optics and a built in lens shade. It also has a larger rear element than the AI and earlier versions, which seems to make a difference with full frame sensors. On DSLR's with aps-c or DX sensors your using the "sweet spot" all the time and it's difficult to get a bad image. The lens is small, compact and well built. If your shopping for a 105mm this is a wonderful lens, but don't forget about the 105mm f1.8 AIS which is often overlooked, IMO it's even better. 100-105mm lenses from Pentax, Minolta, Miranda. Great optical performance, a perfect blend of colour rendition, smoothness and sharpness. Tough build and mechanics, super smooth operation. Very inexpensive in today's digital era. Best when fit on a proper camera body, which means a Nikon film camera or a pro level Nikon DSLR (due to need of aperture ring coupling) with adequate focousing screen. I own an AI-S sample since 1996 and use it on Nikon FM-2n and F3. Despite it's small and inexpensive, I believe this is one of the very best lenses ever. Image quality is extremely high, not just in terms of 'sharpness', but also in terms of a very fine balance between colour rendition, smoothness, out-of-focus transition. Perfect for portraits expecially at f/2.5 or f/2.8, turns into an impressive landscape lens when stopped down to f/4. Build quality is probably the best one can dream of: despite a very heavy optical group, the lens is perfectly solid and everything runs and turns positively and smooth. In my view, this lens is worth owning a 'proper' camera body (a Nikon film camera, or a Nikon pro digital with full meter coupling for AI-S lenses and a viewfinder fit for manual focousing) just to use it the way it should be. Olympus Zuiko 135/3.5, Leica Elmarit-M 90/2.8. i normally don't write reviews but i thought it might help some people out there. I shoot canon and have the nikkor 50 1.2 and 105 f2.5 mounted on my 7D with adapters. A word of warning: these lenses are easier to shoot with on nikon bodies (obviously) as they meter properly on pro bodies and high end entry DSLRs like d300s, d7000 etc. Exposure on my canon is at times inconsistent no matter what mode (aperture or manual) i am shooting in. I borrowed my friend's d700 and shot the whole day today with the combo. Here's what I noticed: sharp even wide open (some people complain about sharpness with most lenses wide open but believe me if you can focus spot on you can get reasonably good results even with the nikkor 50 1.2 @1.2); very high contrast wide open (the high dynamic range of a full frame certainly adds to it); very light and compact: the 105 2.8 macro would extend quite a bit more. I bought the lens for $400 and except for 1-2 tiny scuffs you wouldn't even tell it's second hand so i'm very happy with that. Another thing i liked about it is the focusing throw: it is just perfect - not too long, not too short. I imagine on a 2.8 macro it would be much longer and that cost me some shots with my zeiss 50 f2 makro-planar: perfect for fine tuning but a disaster when you need to focus quickly from one end to another. Also, i find focusing easy because i use katzeye focusing screen (on 7D) which really makes a HUGE difference and with the d700 i was spot on 90% of the time (great viewfinder) but it will be harder on cropped bodies with inferior viewfinders. Bear in mind with canon bodies you'll have to use stop down metering which may be an issue if you like to shoot at narrower apertures as there will be less light available for you to see properly through the viewfinder. Overall, a truly great lens BUT to fully enjoy it use on a full frame. If you're a canon user and use a cropped sensor like i do atm, you may find metering to be inconsistent. That may be a deal breaker for some - i'm switching to nikon anyway so i can bear with it for the time being. Great bokeh. Wonderful focal length on D300. Sharp. Compact with built in shade. Auto focus can be a problem at times things are moving fast. A very nice lens for people and for shooting flower and garden pics. Colors are good and the bokeh is really nice. No problem shooting wide open. Probably the best Ais lens that I have used. Light wieght , easy to focus,best bokeh,tac sharpe,built like a tank,built-in lens hood. Also,,another post here says he has a lens similar to this being a 100mm nikon 2.8 E Lens. Let me tell you,,,,this is so far above the E class of Nikon Lenses that it shouldn't have been mentioned. This is a NIKKOR LENS not cheap Nikon E lens. Only Nikkor is on Nikons BEST Lenses. This lens came in about 4 versions from pre-AI to AIS . The very earliest versions had a diferent set of elements and groups. The real great lenses came around the late sixties and early 70s but they didn't all perform the same as the coatings were being improved over the years. That was about the only thing that was changed but it was a big one reducing ghosting and flare. To get the really best one with all the latest refinements you should get the one with no numbers or markings on the lens and the large rear glass and only buy the AIS version and you will indeed have a Real Nikon Treasure and absolutely Stunning pictures of the ultimate quality. PS,,,,I heard but cannot confirm that this latest version had the N.I.C.,coating on the front glass with a pinkish tint to it. Sharp as can be imo. I have used this lens for a few large panoramas, and it performs really nice. Extremely nice color and great sharpness. I've also used it for a few outdoor portraits - extremely nice bokeh and sharpness. I was really lucky to get it at the price I did, but I would even have paid 2-3 times that. Great Lens. Not only is does this lens take razor sharp picture with ery nice bokeh, it is extremely bautiful and well made. The focusing ring is silky smooth, the glass is coated, it is hefty but not heavy, all metal, and the range of aperture f2.5 - f32 is a photographers dream. At first I thought it was a Macro lens, because of the f32 minimum aperture but apparently it isn't . With a couple of tubes however, you should be able to get pretty good magnification and working distance with this lens. I swithched to digital and AF years ago , but lenses like these is what keeps me coming back to film. - goes great with the 50mm f1.8 since both accept the same 52mm filters. NO AUTO FOCUS. this may be a deal killer for some esp. older shooters. But if your eyes are still fairly good and you dont mind shooting an extra frame or two to CYA for focus, then its a fair exchange for the price. It has a moderate weight. I dont understand people sayings its light and short. its not but its not a hulking beast either. With the hood it almost doubles in length. However, I'm not sure why everyone is raving about this lens other than its a solid telephoto portrait lens and great find for the price-- one person claiming its a "silver bullet", is crazy. Another other person claiming they spent $2000 for this lens is beyond belief as well. As of 2009, this is a great used lens to find. I wouldnt pay over $375 for a mint one, and i wouldnt pay more than $250 for a used one. I bought mine heavily used (bargin) through Keh.com for around $180 and was very pleased. The metal showed the wear of a 20-30 year old lens, but the glass was near perfect. It has a nice shallow depth of field however since theres no autofocus of VR it will usually produce more soft images. I find its sharper around the f5-f11, wide open produces more buttery soft images. similar Nikkor telephotos of the same length.